John Parker, 1st Baron Boringdon (1734/5 – 27 April 1788), was the owner of Saltram near Plymouth in Devon. 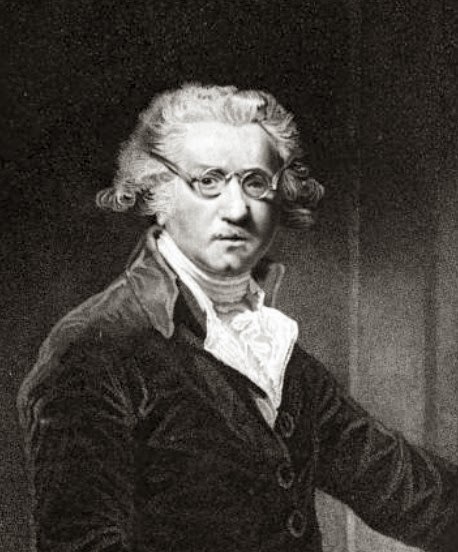 He was an MP and a great patron and friend of Sir Joshua Reynolds. John Parker, 1st Baron Boringdon, was born in Devon in 1734/5, the elder son of John Parker of Saltram and his wife Catherine, daughter of the 1st Earl Poulett. Before his parents moved to Saltram, John attended Plympton Grammar School where Sir Joshua Reynold’s father was headmaster. John attended university at Christ Church Oxford with William Petty, later 2nd Earl of Shelburne, and it was through the influence of Lord Shelburne and Lord Bute that John was returned as MP for Bodmin (1761-2) and then Devon (1762-1784). He was made 1st Baron Boringdon in 1784. 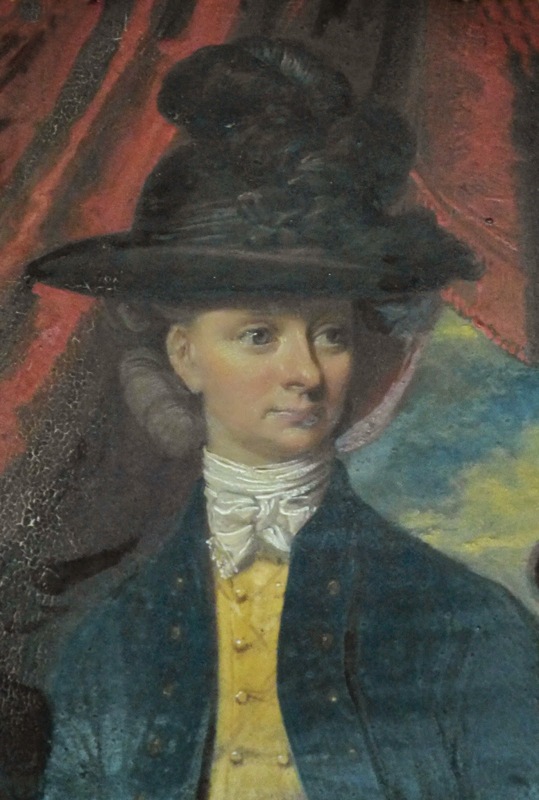 On 10 January 1764, John married Frances Hort, a cousin of Lord Shelburne, but sadly Frances became ill and died during a trip to Naples the same year. 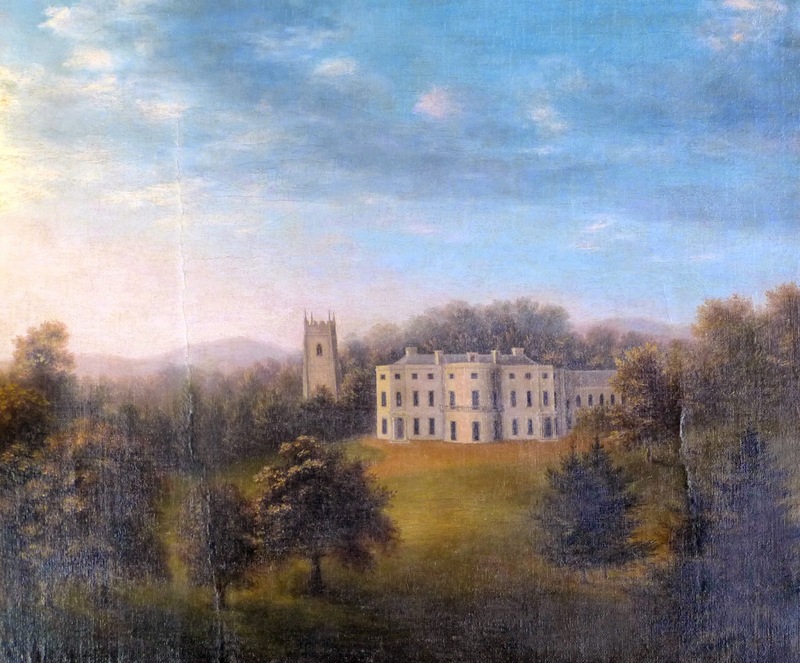 In 1768, John inherited Saltram on the death of his father. Over £32,000 in cash was discovered hidden around the house! 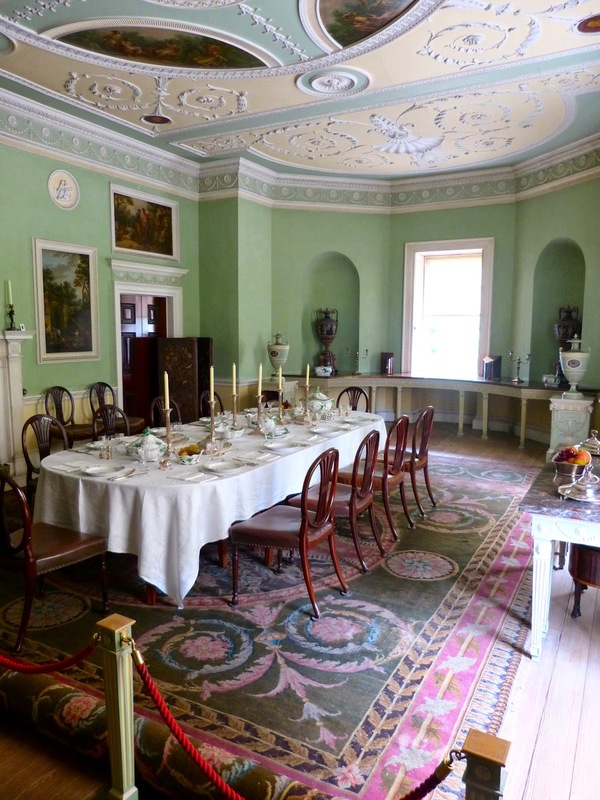 With this money, he was able to commission Robert Adam to build two new rooms for Saltram – the Saloon and the Library, which has since been changed into the Dining Room. He also built the Castle and the Orangery and a new estate entrance flanked by stags. On 18 May 1769, John married Theresa Robinson, a daughter of the 1st Lord Grantham. 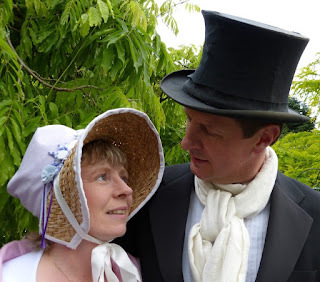 They were very happy together, dividing their time between London and Saltram. They had two children, John and Theresa, but John’s wife became ill shortly after the birth of their daughter and died in 1775. John was devastated. 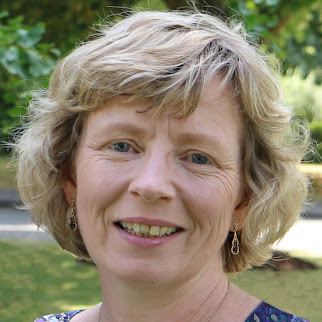 His wife’s elder sister, Anne – “Aunt Nanny” – came to live at Saltram to look after the children. John was well-suited to the life of the country gentleman, riding, shooting and hunting over the countryside. He enjoyed playing cards and had a passion for gambling, whether at his London clubs, casually placing bets with his friends or at the races. One of John’s biggest extravagances was his stables. He was very fond of horseracing and bred a number of successful racehorses. In 1783, his horse, Saltram, won the Derby at Epsom. It cost 50 guineas to enter the race with prize money of 900 guineas. The jockey wore the Parker colours of green shirt and breeches with a black cap. The horse was painted by John Nost Sartorius in the year of its famous victory. 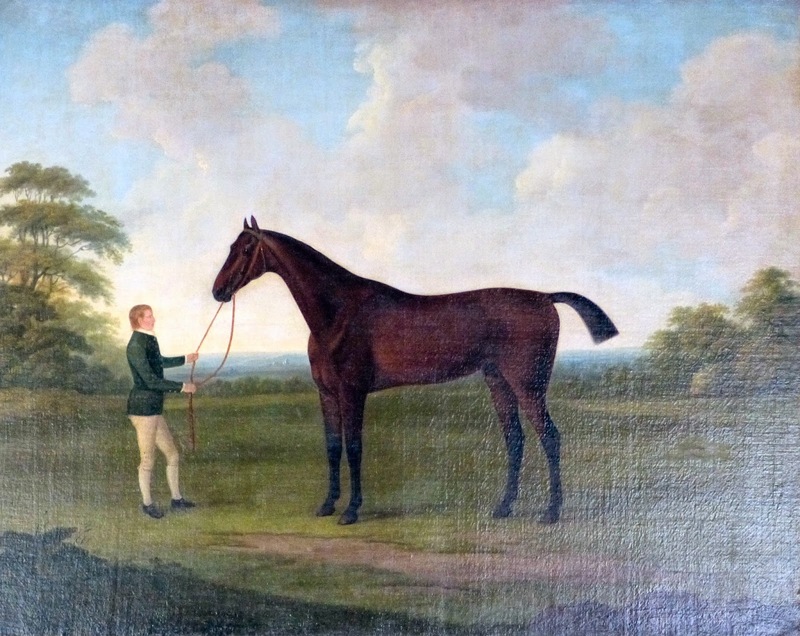 Another successful horse, Anvil, was sold to the Prince of Wales in 1784 for 800 guineas. 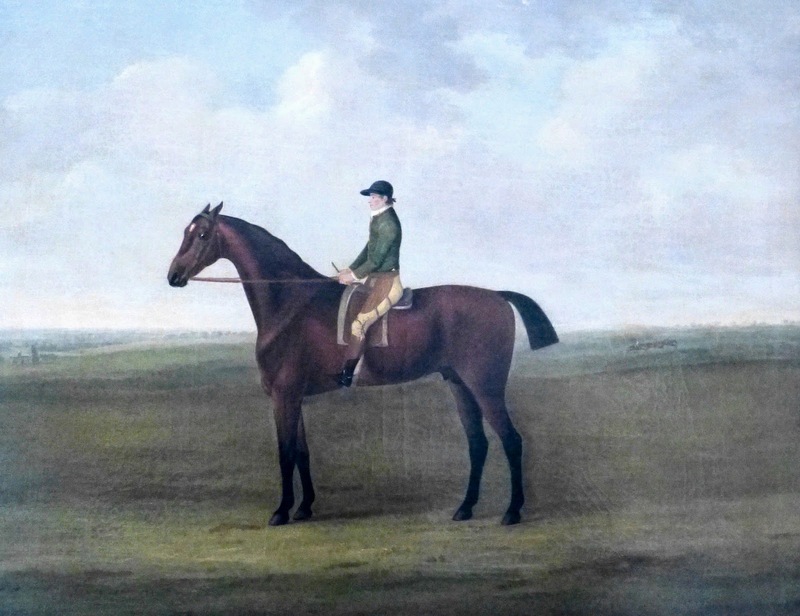 Sartorius painted this horse and its jockey, Charles Handley, with Newmarket racecourse in the background. John was great friends with the painter Sir Joshua Reynolds who came from nearby Plympton. Sir Joshua had painted a number of portraits for John’s parents and John continued to be his patron and friend. When in London, John often stayed with Sir Joshua and was introduced to his circle of friends, including Samuel Johnson, David Garrick and James Boswell. Towards the end of his life, John suffered increasingly from gout and “the bleeding of his chest” (2). 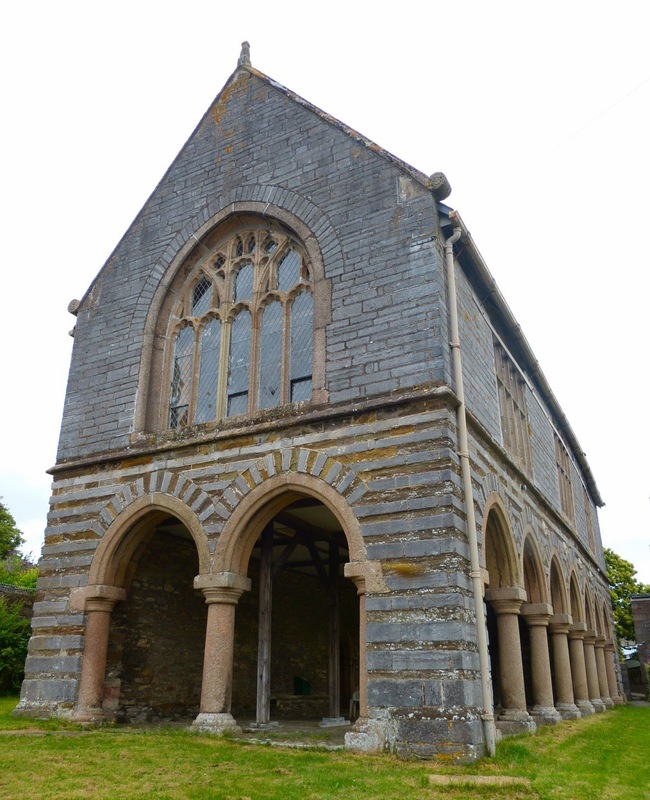 He died on 27 April 1788 and was buried in St Mary’s Church, Plympton. His work on the house and gardens, inefficient estate management, his horses and his gambling left behind a huge debt of between £56,000 and £58,000. 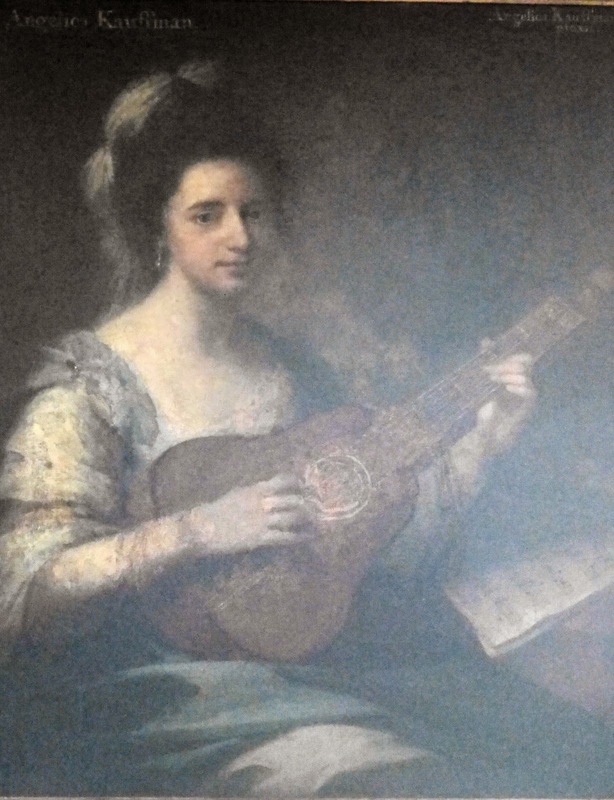 (1) This painting is incorrectly labelled as Lady Catherine Parker. See the BBC paintings website for details. 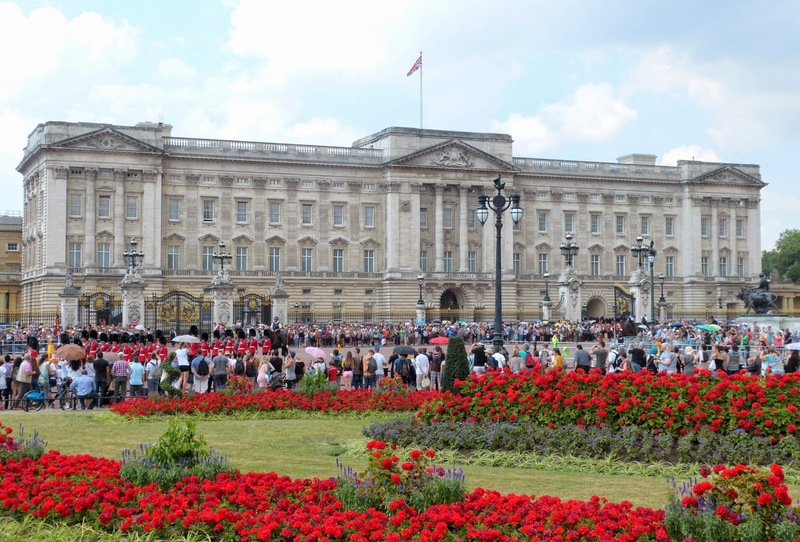 The state rooms at Buckingham Palace opened today for the summer season: 26 July until 28 September 2014. Two rooms in the palace, The Ballroom and The Ball Supper Room, have been given over to this year’s exhibition: Royal Childhood. I was invited to attend the preview yesterday and was eager to see what gems from the Georgian royals were included in the exhibition. 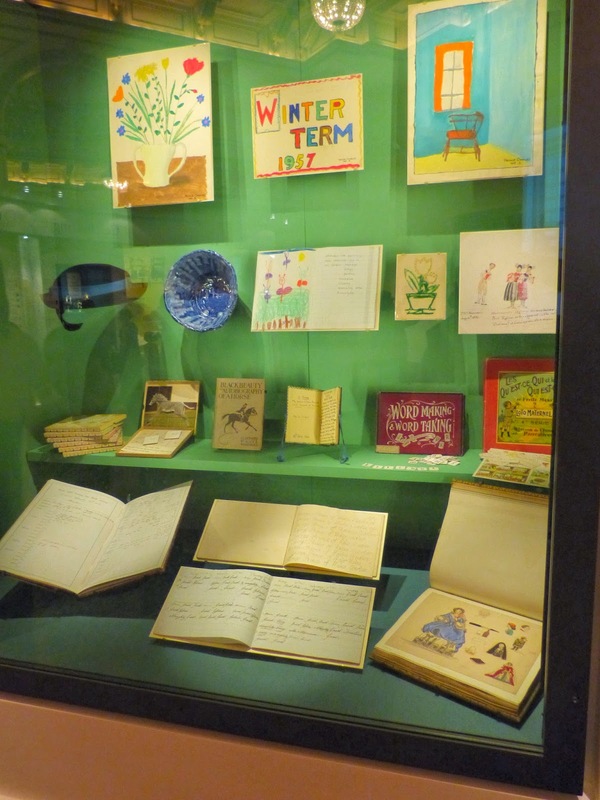 Royal Childhood features toys, workbooks and children’s clothes belonging to members of the royal family, from George IV and his siblings to Prince George of Cambridge. The items were arranged by theme, rather than by date, so objects from 200 years ago were alongside very recent things. I confess I have a preference for chronological presentation – I like to see the way things progress from period to period - but the themes worked well and it was interesting to see whether I could pick out the really old things before I read the placards. 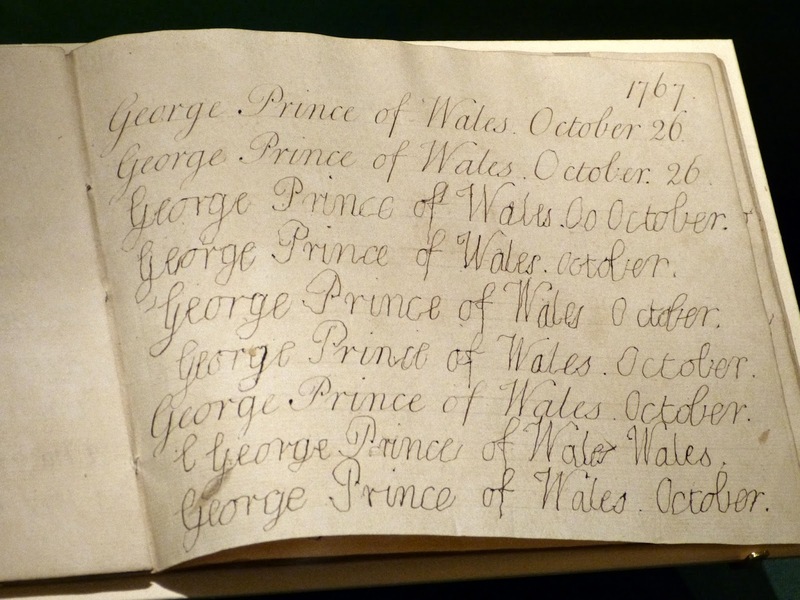 One of the oldest items on display was in the learning section – an exercise book used by George, Prince of Wales, later George IV, for handwriting practice. The book was dated 1767 suggesting that he was only five years old at the time. I think the writing is very impressive for a five year old! I was disappointed that the only toys in the exhibition which had been used by George IV or his siblings were two silver rattles. I had hoped to see something that the young Princes and Princesses had played with as children, but I am guessing that very little has survived. After all, there were fifteen children and things do not tend to last if they get passed down from child to child as I am well aware (and I only had four!). The silver filigree rattle (left) was given to the future George IV by Lady Charlotte Finch, the children’s governess, soon after his birth in 1762. The term filigree refers to the fine detailed decorative silver work on the rattle. Apparently this rattle was also used by Queen Victoria’s children, so it must be quite robust to have survived. 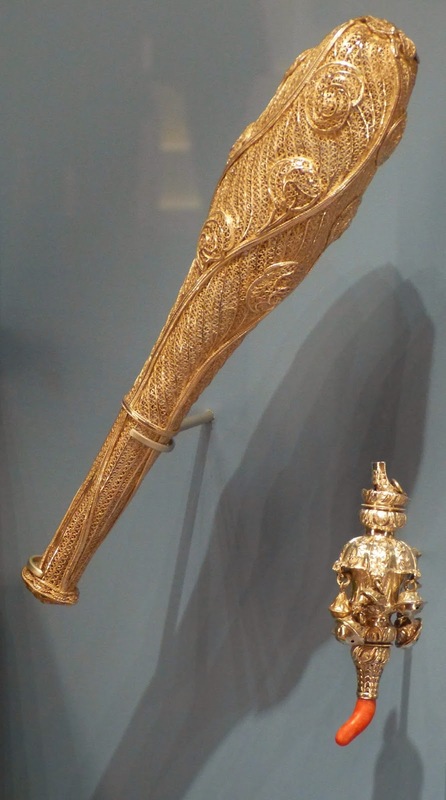 The second rattle (right) was made of silver and coral and was used by Prince Adolphus, Duke of Cambridge, one of George IV’s younger brothers, in 1774. In contrast, there were lots of Victorian items on display. 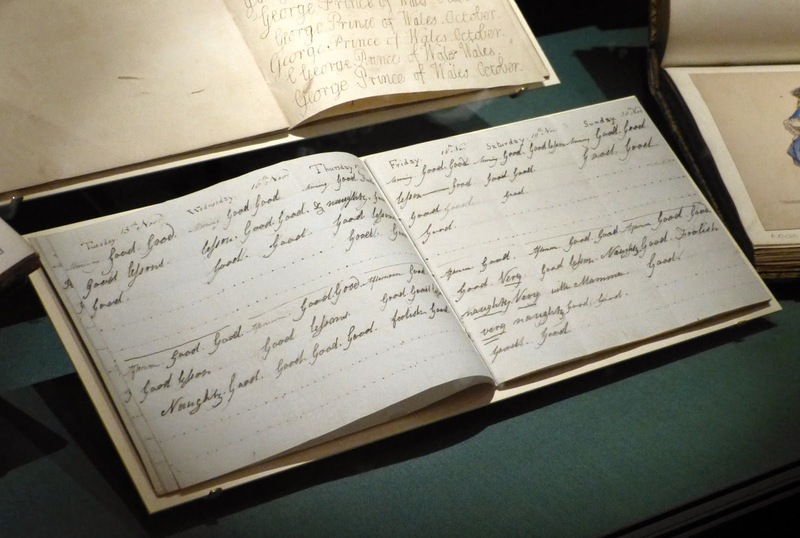 One of my favourites was the young Princess Victoria’s behaviour book – a day by day list of whether the young Princess had behaved well in her lessons. Although there were lots of ‘goods’, there was also a ‘very, very naughty’ in the entry for the afternoon of 18 November1831! 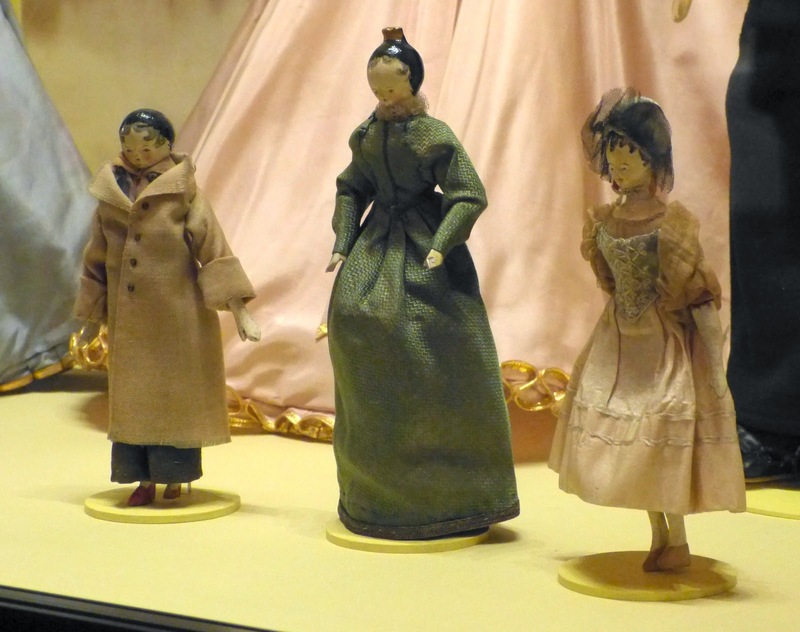 There was also a beautiful dress from about 1830 which had been worn by Princess Victoria as a girl and three wooden dolls which she had played with. 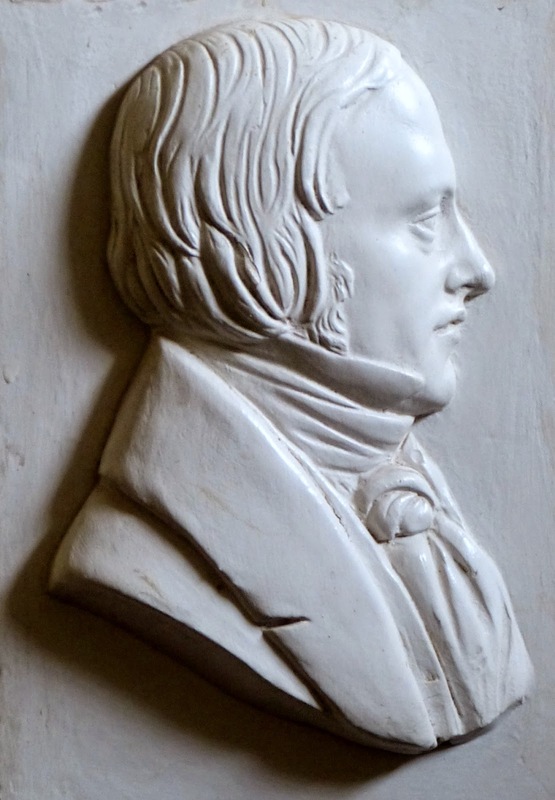 I did not much like the marble replica of Queen Victoria’s son Albert’s arm – I found it rather eerie! Apparently Victoria had 14 carvings of arms, legs and feet of her children made by taking plaster casts while the child was sleeping before being sculpted in marble by the artist. 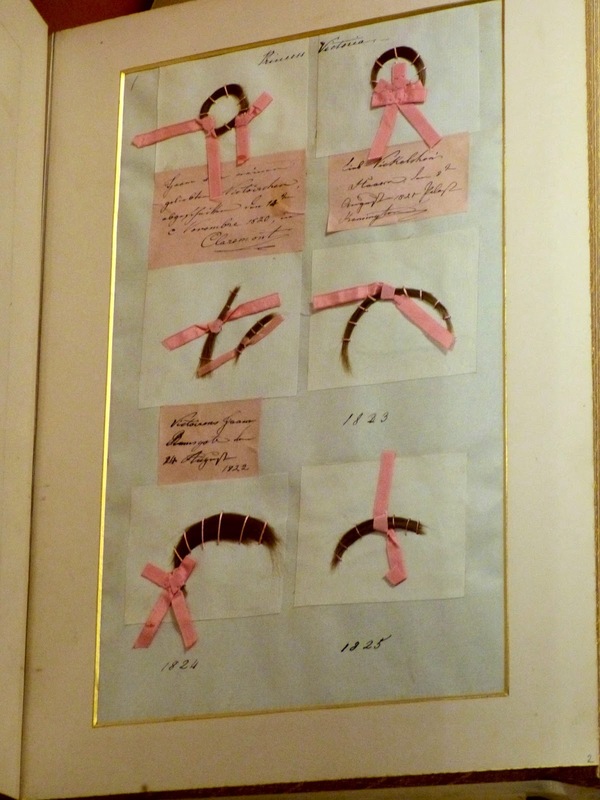 The selection of locks of Princess Victoria’s hair was quite charming, but I did not care for her collection of her children’s first teeth! 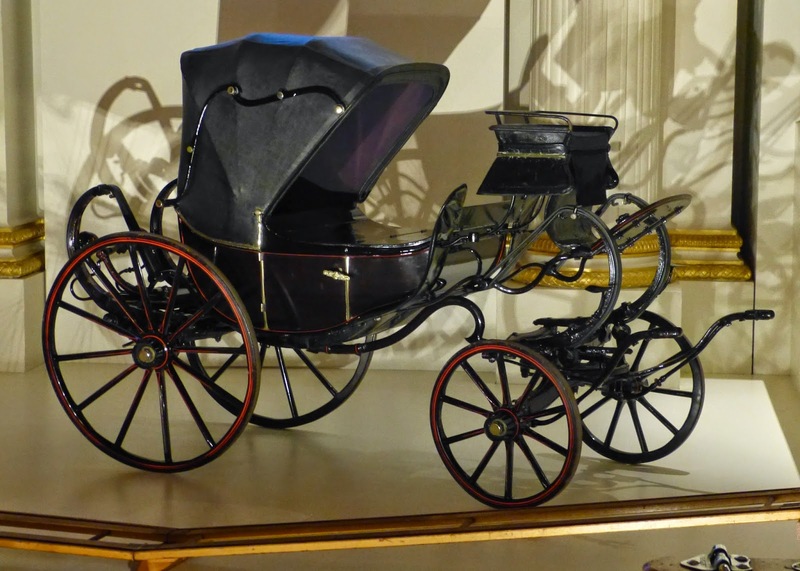 My favourite was the miniature barouche which Queen Victoria’s children played with, which used to be pulled along by a donkey. 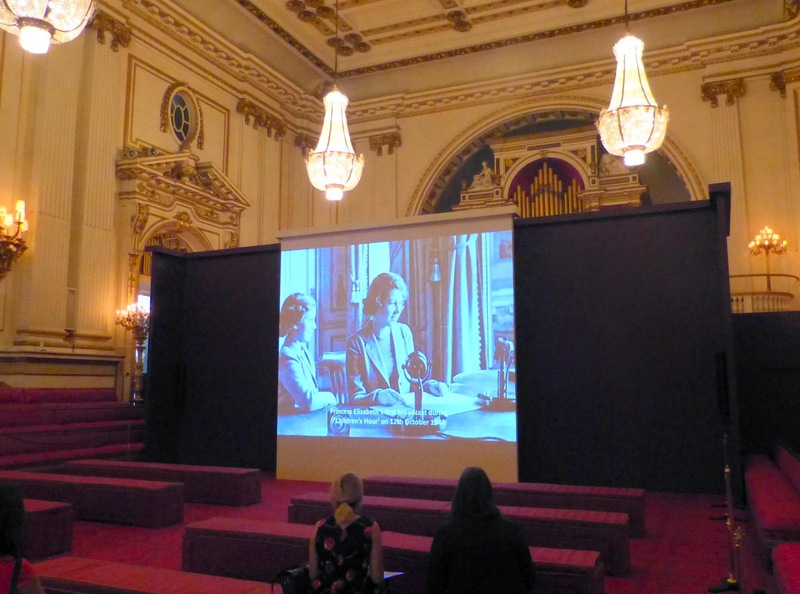 The exhibition included some footage of the Queen and Princess Margaret as girls and also of the Queen’s children playing with Prince Philip featuring several of the toys on display. 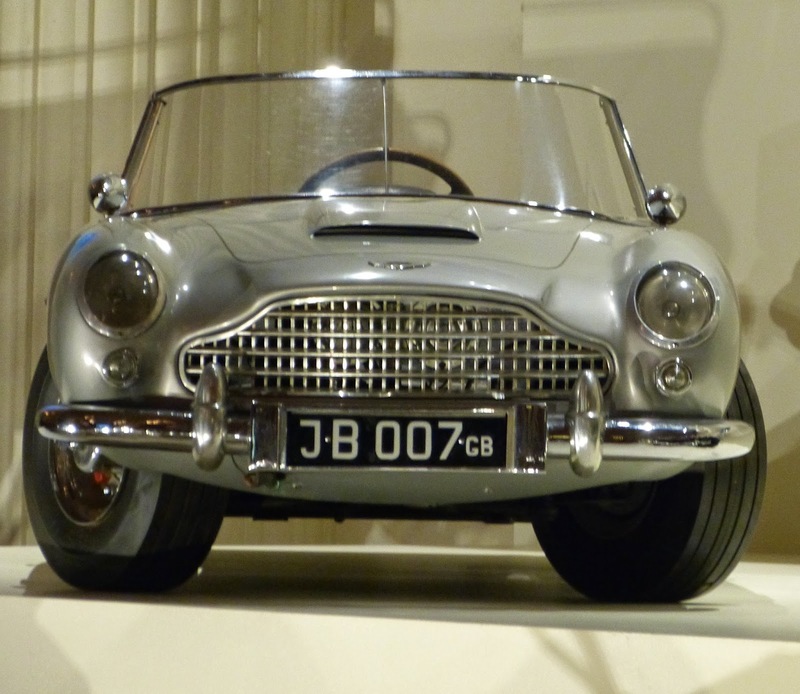 Of the recent items, two stood out for me: a wonderful soldier dressing gown that belonged to the three year old Prince Harry and a miniature replica of James Bond’s car that was given to Prince Andrew in 1966, complete with revolving number plates, toy machine guns behind the side-lights and a working smoke screen. I thoroughly enjoyed the treat of going round the state rooms of Buckingham Palace with only a handful of people instead of hundreds of other visitors. Although the Royal Childhood exhibition did not fulfil my craving for information about the Georgian royals, it was a well-presented display and I found the film clips showing the toys in use particularly engaging. The palace was also geared up for children with a new family multimedia guide instead of the regular audio guide to the state rooms and a new family pavilion in the gardens with children’s activities. And there was more about the childhood of the Georgian royals apart from the exhibition. 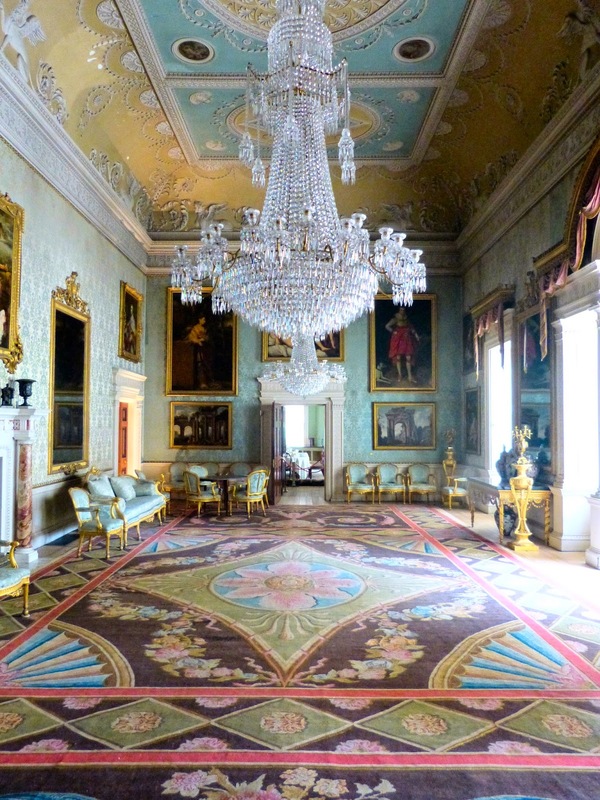 There were various portraits around the palace depicting George IV and his siblings as children. 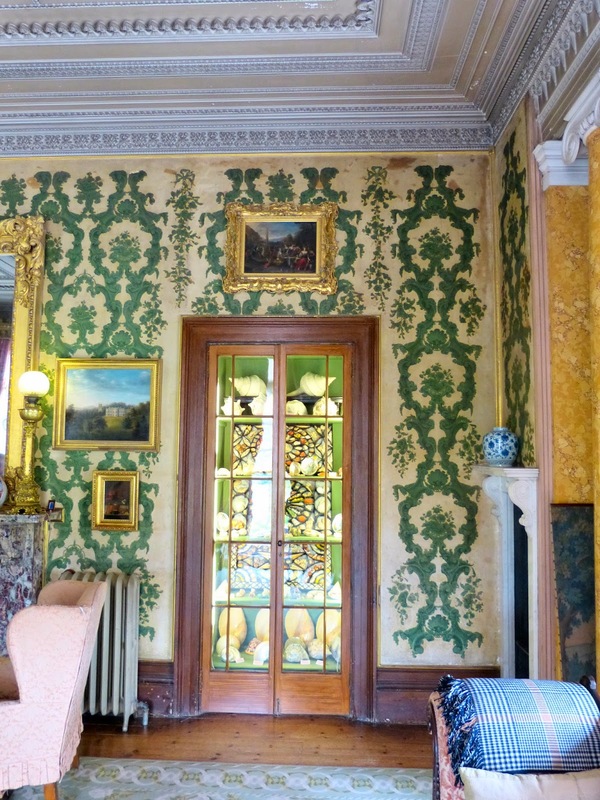 In particular, there was a charming portrait of Princesses Mary, Sophia and Amelia in the Green Drawing Room, with Mary waving her tambourine and dogs joining in the game. There was also a ‘baby house’ or doll’s house played with by the Princesses in the 1780s on display. Buckingham Palace as a whole has so much to offer the Georgian enthusiast. 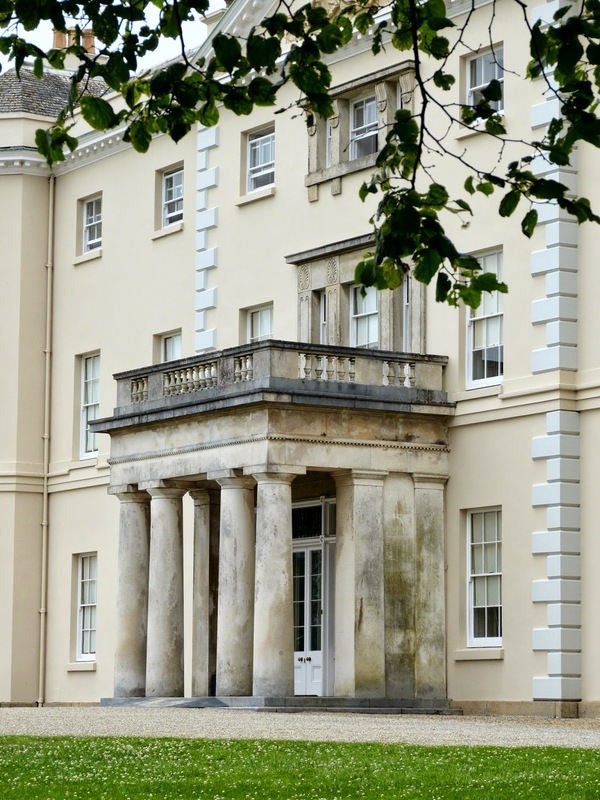 The original house was bought by George III for Queen Charlotte and much of the palace was designed by John Nash under commission from George IV. I did not count how many portraits of George IV were on display, but there seemed to be more of him than of anyone else! More about the exhibition on the Royal Collection website. Saltram is a Georgian mansion just outside Plymouth in Devon. 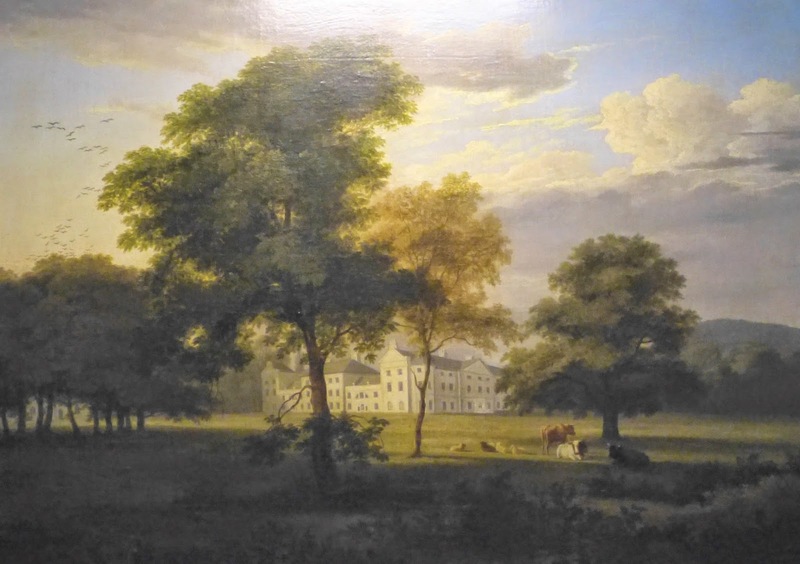 Before the civil war, Saltram was owned by the Bagge family. One of them, James Bagge, was a particularly disreputable character. He was an intimate friend of James I’s favourite, the Duke of Buckingham, who was a frequent visitor at Saltram, but he died in disgrace in 1638 after embezzling funds entrusted to him to supply the King’s fleet. His son George was more respectable and became Deputy Governor of Plymouth, but as a Royalist, he had to forfeit the estate to Parliament after the civil war. 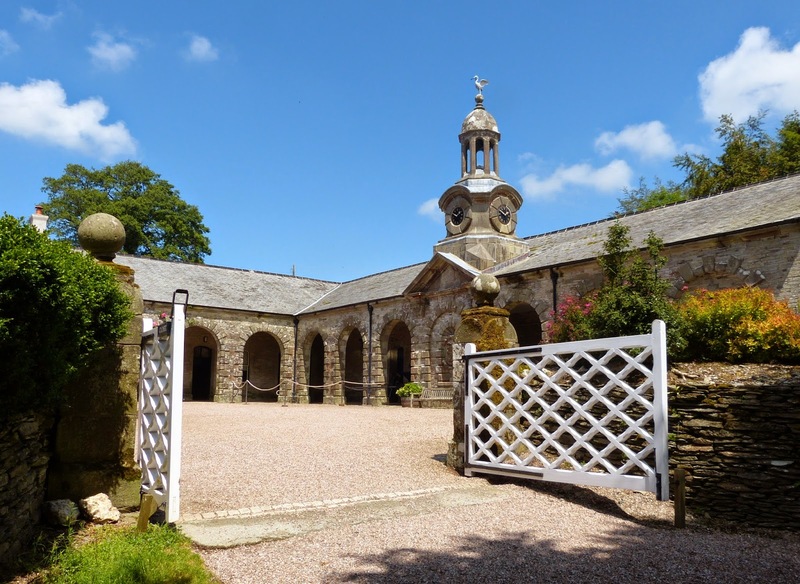 When the monarchy was restored, the estate was given to Sir George Carteret who sold it to George Parker, a wealthy squire from Boringdon, in 1712. The house remained in the Parker family until it was given to HM Treasury in lieu of death duties in 1957 and then passed into the care of the National Trust. 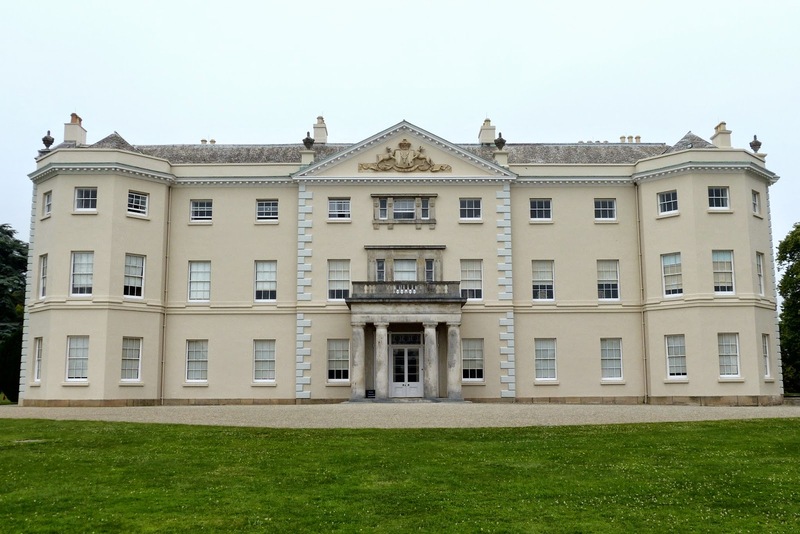 George Parker bought Saltram in 1712 and let the house to tenants. 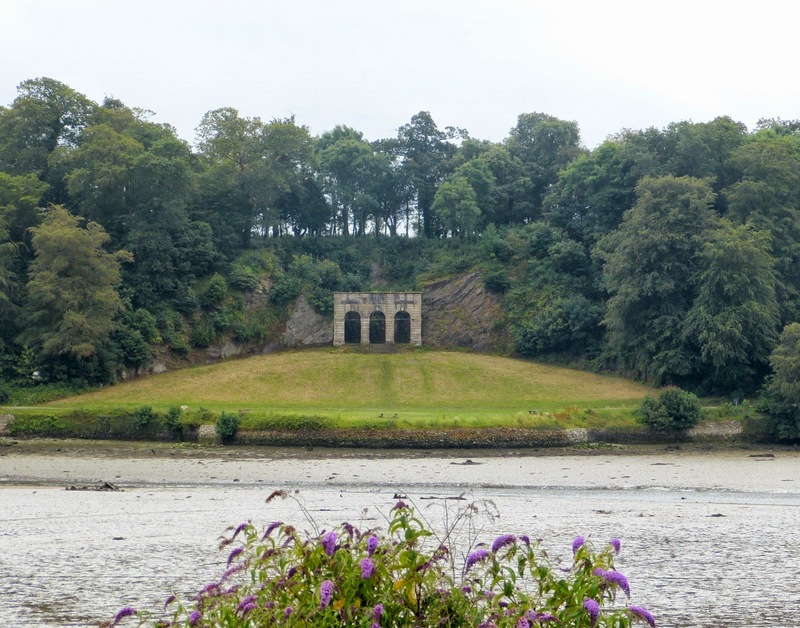 His son John inherited in 1743, and John and his wife Catherine, daughter of the 1st Earl Poulett, decided to make Saltram their home. The house they inherited was a three-storey house built around a central courtyard. They commissioned a local architect to give the house a new look by adding three distinct classical façades to the existing building and they extensively remodelled the interior. 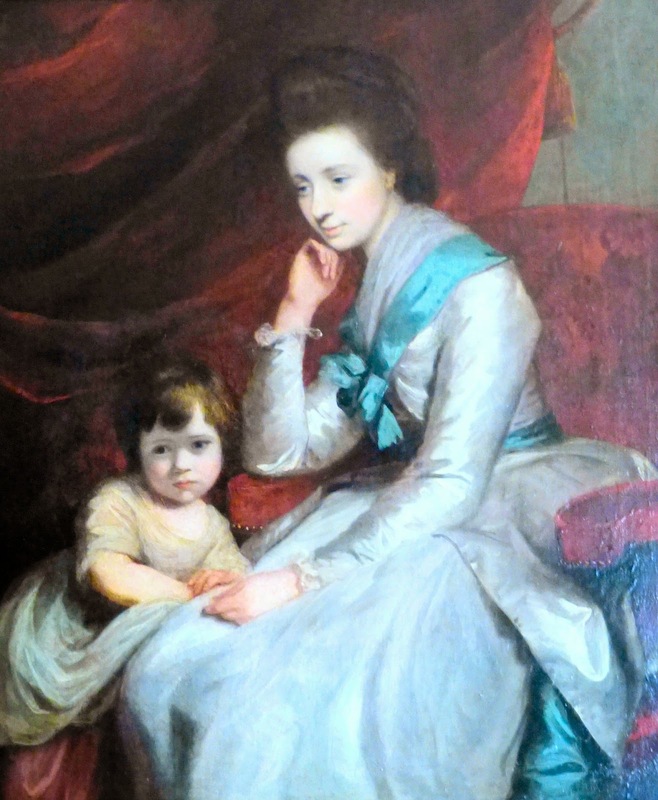 Lady Catherine had superior taste and was an early patron of Sir Joshua Reynolds who came from nearby Plympton. 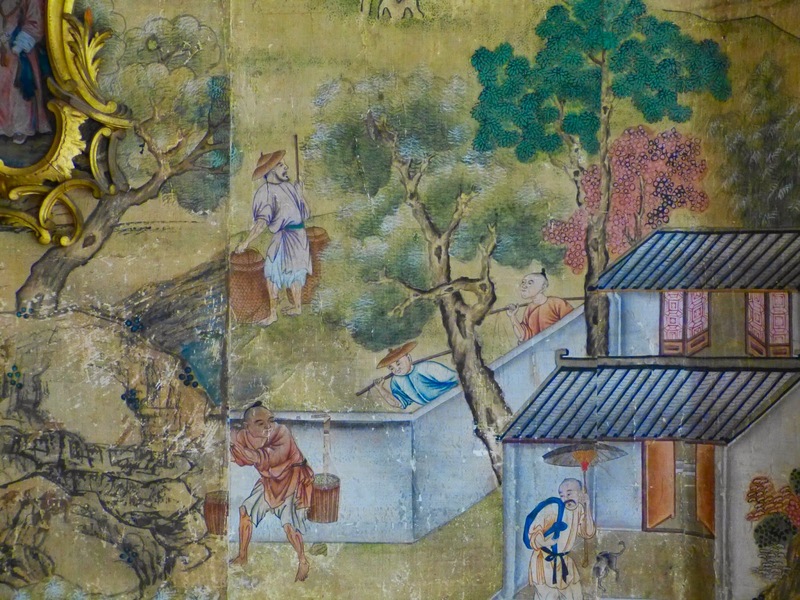 She was almost certainly responsible for the introduction of the fashionable Chinese wallpapers used in several of the first floor rooms. 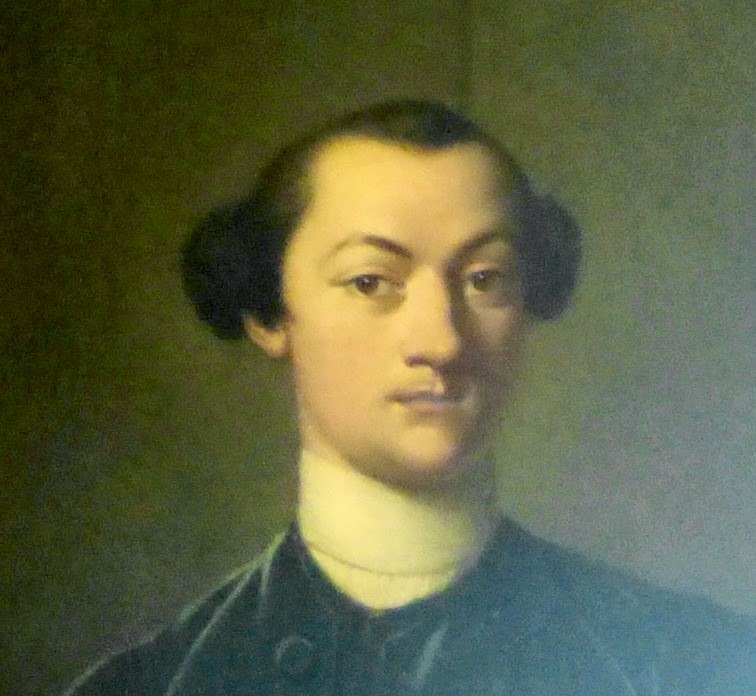 John Parker II was MP for Bodmin and then Devon and was made 1st Baron Boringdon in 1784. He lived at Saltram with his second wife, Theresa Robinson, and continued to remodel the house and gardens. 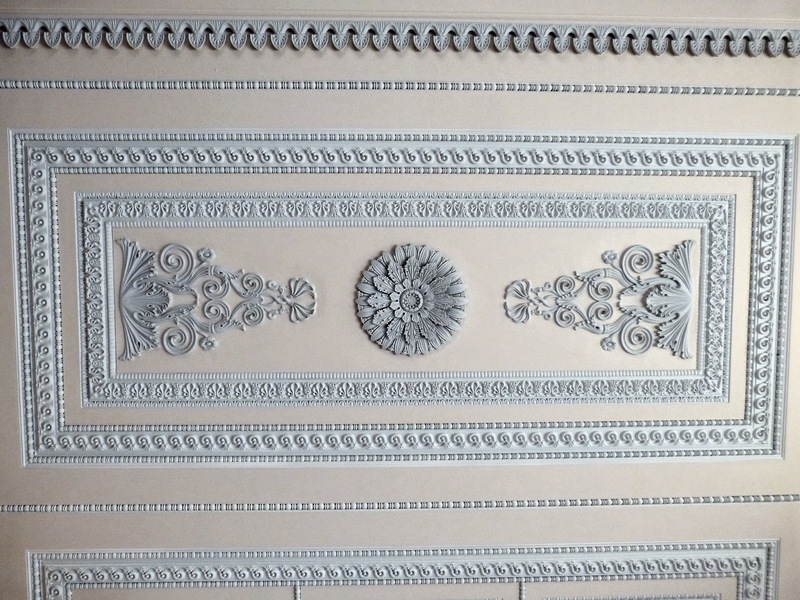 He appointed Robert Adam to design the Saloon and Library (now the Dining Room), and added new features to the gardens, such as the Orangery. 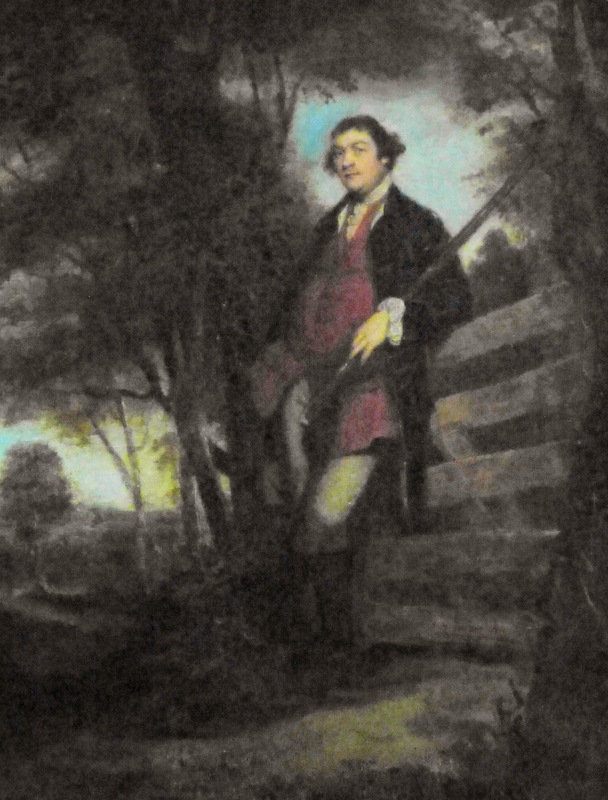 John was good friends with Sir Joshua Reynolds who often visited Saltram and painted a number of portraits for the family. 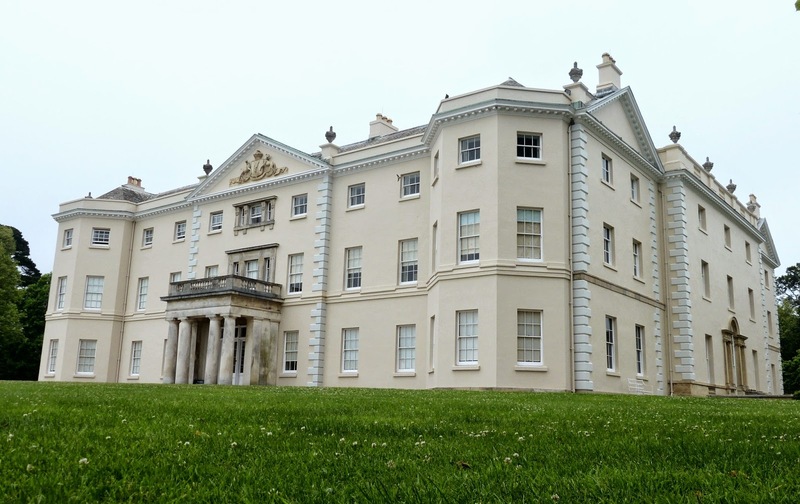 John Parker III’s mother died when he was three years old and his aunt, Anne “Nanny” Robinson, looked after him and his sister Theresa at Saltram. He inherited on his father’s death in 1788, before he had reached his majority. 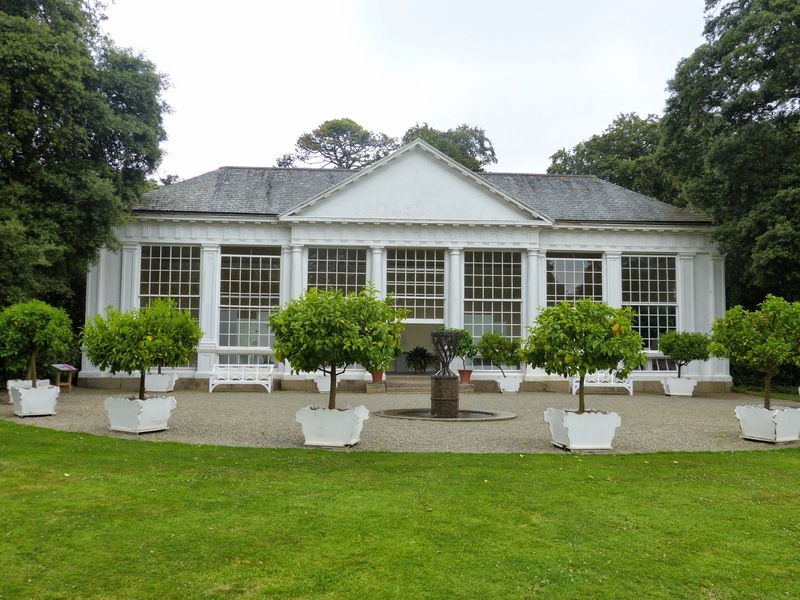 George III and Queen Charlotte stayed at Saltram in August 1789 whilst they visited Plymouth and the surrounding area. John married twice, firstly to Augusta Fane who scandalously eloped with Sir Arthur Paget, and secondly to Frances Talbot. In 1815, John was made Viscount Boringdon and Earl of Morley. 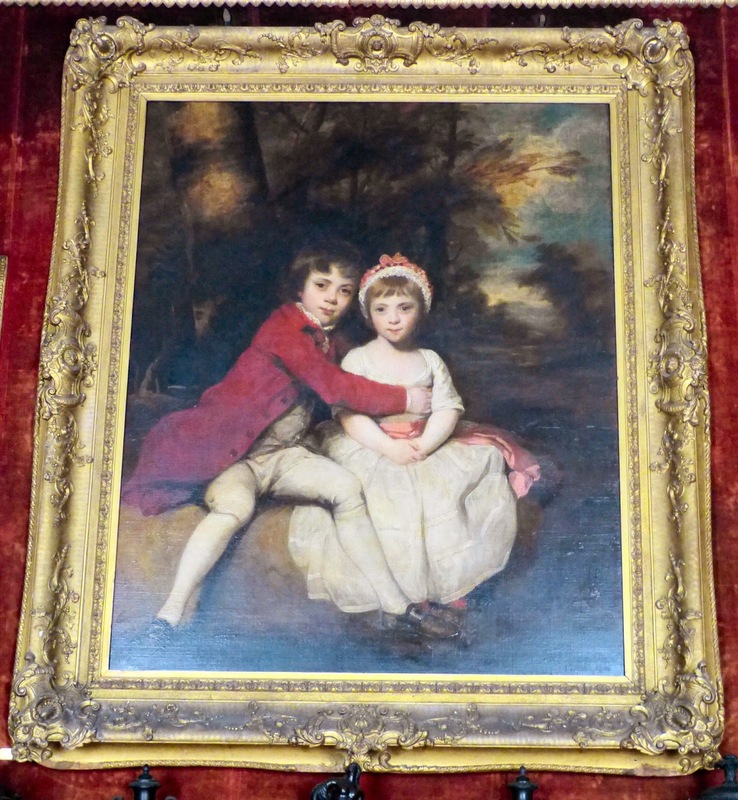 • Portraits by Sir Joshua Reynolds, such as this one of John Parker III and his sister Theresa as children. • Portraits by Angelica Kauffman, such as this self-portrait hanging in the library. 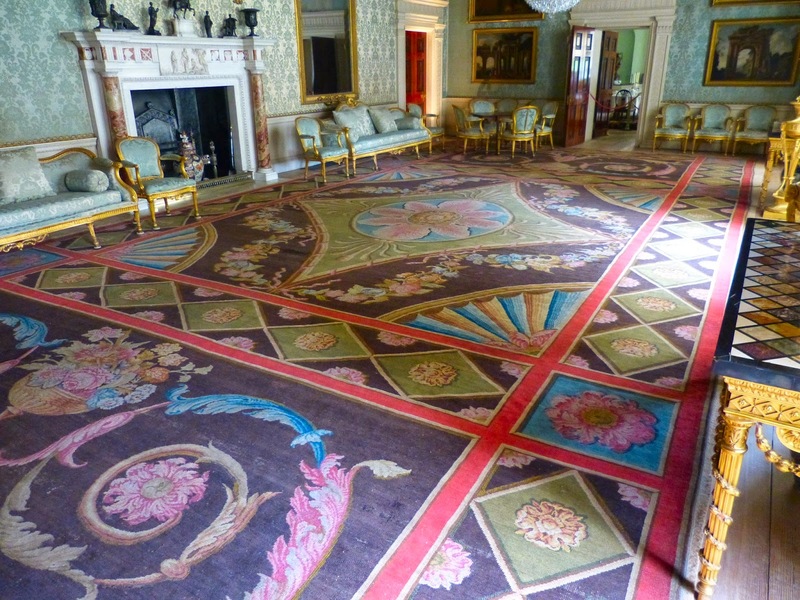 • The Saloon designed by Robert Adam. 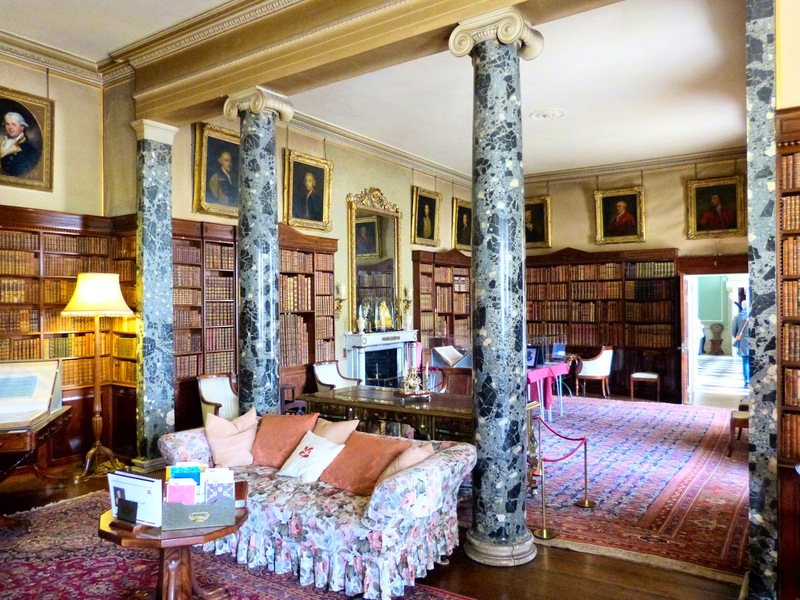 • The Dining Room, designed by Robert Adam as the Library. • The Library, with a writing desk dating from c1700 believed to have belonged to Louis XIV. 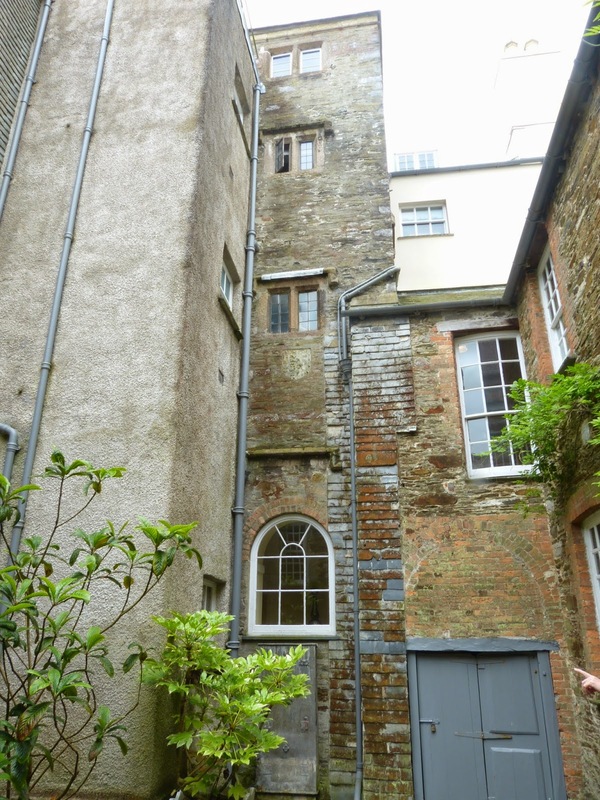 • The Tudor courtyard, showing a glimpse of the original building. • The Amphitheatre on the banks of the river, thought to date from pre 1743. 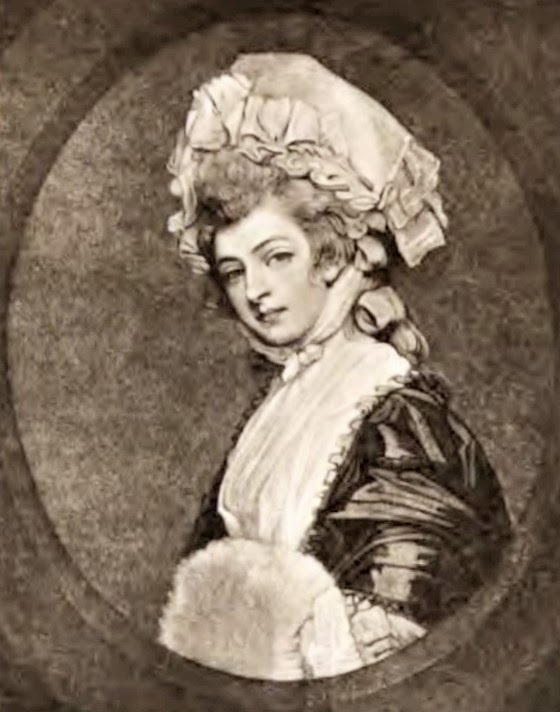 Mary 'Perdita' Robinson (1757-1800) was an actress who famously became the first mistress of George IV when he was still a teenager. But what is less well known today is that in addition to her beauty, her exalted lover and her success on the stage, Mary was a talented writer. In 1775, Mary published her first volume of poems. She presented the Duchess of Devonshire with a copy, and in return, the Duchess was pleased to offer her support. A second volume of poems in 1777 was dedicated to her patroness. A severe illness in 1783 left Mary lame and she struggled with ill health for the rest of her life. The following year, Lister published his Memoirs of Perdita, a scandalous history of Mary's life that she was eager to contradict. She wanted to create a new persona for herself as a respectable person and not as the courtesan Perdita that the world labelled her. Her writing gave her that opportunity. On 14 July 1786, The Morning Post announced that Mrs Robinson, the once famous Perdita, had died a few days before in Paris. It printed an obituary that praised her beauty and person but reminded its readers of her immoral relationships. Mary’s response was to write a witty letter declaring that she was alive and well, apart from her lameness, and implying that the details of her life were as fictional as her death. In 1788, Mary started writing poems under the pseudonym of Laura in response to Robert Merry’s Della Crusca in The World. The Della Cruscans favoured a flowery sort of poetry and included Hannah Cowley and Hester Theale amongst their number. When The Oracle started up as a rival paper to The World, Mary became its regular poet, writing under the pseudonym Laura Maria. One poem of particular note was Insanity (1791) which Mary composed whilst drugged with opium to dull the pain of her illness. It was later renamed The Maniac. Mary also wrote poems for The Morning Post and essays under the pseudonym The Sylphid. 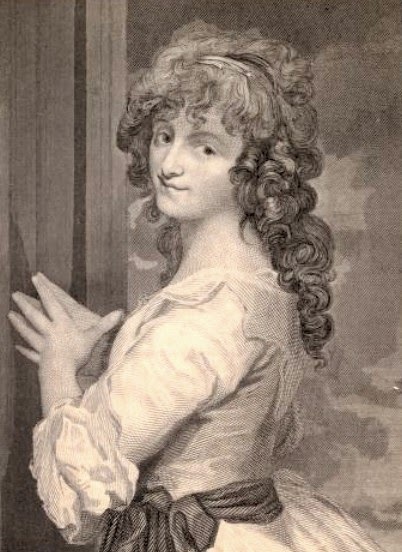 Mary published a deluxe anthology of her poems in 1791 with 600 subscribers. It was later republished as a cheaper volume as The Beauties of Mrs Robinson. It was generally well received by the critics and the Monthly Review labelled Mary “our English Sappho” – a nickname that stuck. Her final volume of poetry – Lyrical Tales – was published in 1800 shortly before her death. Mary wrote a number of novels of varying quality. Her first, Vancenza, or the Dangers of Credulity (1792) was a Gothic romance and included veiled references to the Prince of Wales. Her second novel, The Widow, or a Picture of Modern Times (1794), painted faro players in a bad light and was less popular. Angelina (1796) was enthusiastically reviewed by Mary Wollstonecraft, but Hubert de Sevrac: A Romance of the Eighteenth Century (1796) was hastily written and was a rather poor Gothic novel. Walsingham (1797) had a cross-dressed hero/heroine, The False Friend (1799) was full of feminist ideas and The Natural Daughter, with portraits of the Leadenhead Family (1799) was her most autobiographical novel but was poorly received because of its radical content. Mary returned to the theatre, not to perform, but to write. However her major attempts did not meet with success. Her play, Nobody, written to showcase the comedic talents of Dora Jordan, but its anti-gambling undertones prompted hate mail to Mary and Dora and it failed after only three performances. Another play, A Sicilian Lover – a tragedy – was greatly admired by the Duke of Leeds, but poorly received by everyone else. She also wrote an opera for Sheridan called Kate of Aberdeen, but it was never performed. Toward the end of her life, Mary became increasingly radical in her views, possibly influenced by such friends as William Godwin and Mary Wollstonecraft. In 1790, she wrote a poem Ainsi va le Monde, in support of the French revolution, inscribed to Robert Merry. 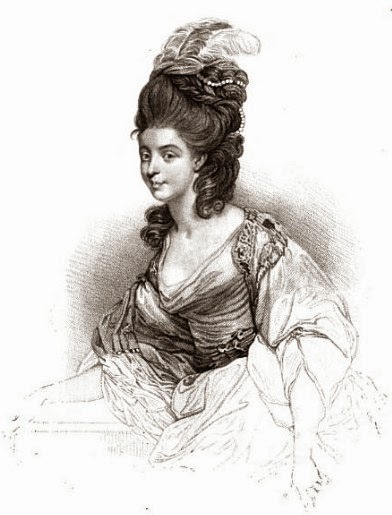 She also wrote anti-slavery poems and a feminist essay - A Letter to the Women of England, on the Injustice of Mental Subordination (1799) under the pseudonym of Anne Frances Randall. In this essay she advocated the creation of a university for women. Mary wrote a monody – a poem lamenting another’s death – in honour of her close friend Sir Joshua Reynolds who died in 1792 and another to the memory of Marie Antoinette in 1793. Intense personal emotion also impelled her to write Stanzas written between Dover and Calais, July 24th 1792 inscribed to .… which were dedicated to her lover Tarleton, when she thought they had separated irrevocably. The stanzas were set to music and became very popular. Tarleton’s History of the Campaigns in Virginia and the Neighbouring Provinces (1787) was generally believed to have been written, at least in part, by Mary. Mary also wrote her memoirs - Memoirs of the Late Mrs Robinson written by herself (1801) - which, though undeniably biased in her own favour, are one of the first examples of an English author writing an autobiography. They were published posthumously by her daughter. 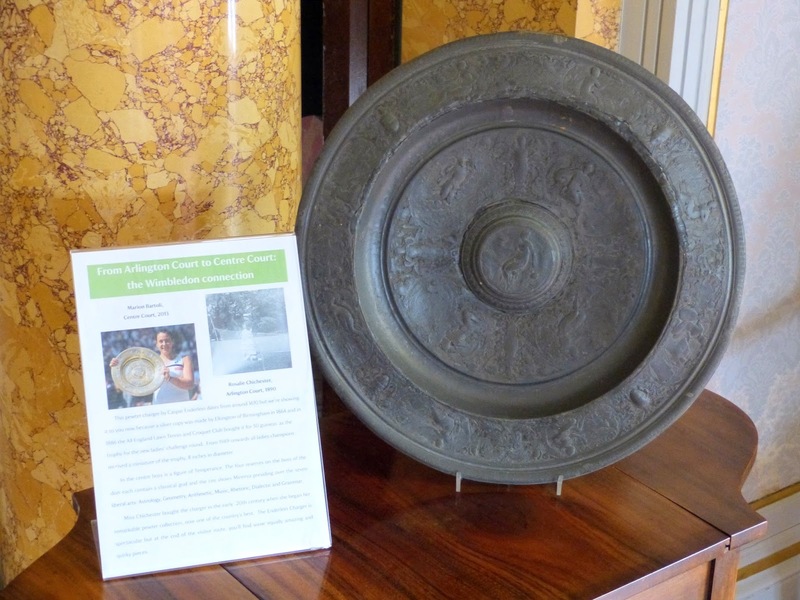 When I visited Arlington Court last week, I discovered that it has a special connection with the tennis championships at Wimbledon: the ladies’ singles trophy - the Rosewater Dish – was copied from a large pewter dish which is currently on display in the White Drawing Room. The pewter dish, sometimes called a charger because it is more than 18 inches in diameter, was cast by Caspar Enderlein of Nuremberg in 1611. It is decorated with figures from classical mythology. The design is not very easy to work out, but the placard next to the charger explained the engravings. In the centre is the goddess of Temperance sitting on a chest with a lamp in her right hand and a jug in her left hand and other objects including a sickle and fork around her. The central part of the dish shows four gods from classical mythology whilst the area around the rim shows the goddess Minerva ruling over the seven liberal arts: Astrology, Geometry, Arithmetic, Music, Rhetoric, Dialectic and Grammar. 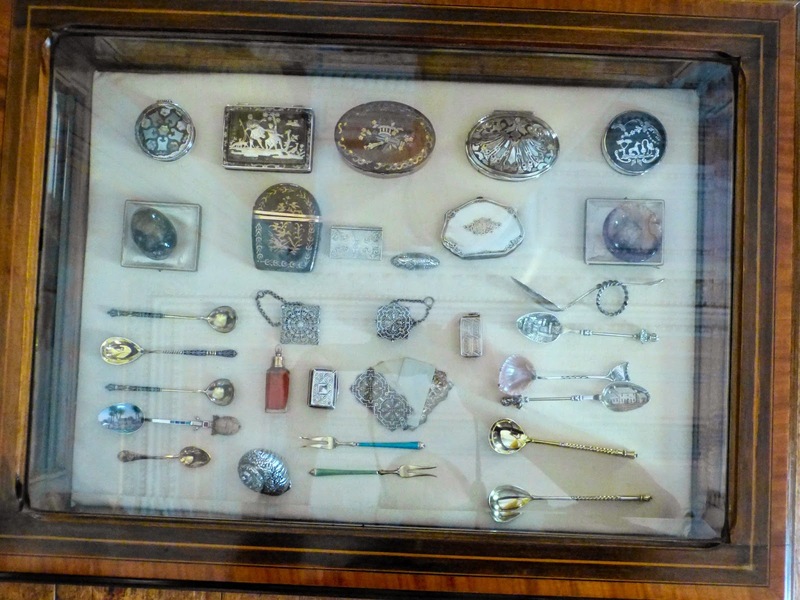 Miss Chichester bought the charger in the early 20th century as part of her large pewter collection. The Rosewater Dish, sometimes called the Venus Rosewater Dish, is a partly gilded sterling silver copy of the pewter charger and was made by Elkington of Birmingham in 1864. The All England Lawn Tennis and Croquet Club bought the silver salver for 50 guineas as the trophy for the new ladies’ championship in 1886. Each year, the ladies' champion receives a miniature version of the salver to keep. I like the suggestion made on the Arlington Court website that this design was chosen for the ladies’ trophy because the central figure of Sophrosyne, the Greek goddess of moderation, self-control, temperance, restraint, and discretion, represented desirable character traits for Victorian women athletes! I discovered that the V&A also owns a piece known as the Temperantia Basin made by Francois Briot around 1585. It would seem that the Enderlein chargers were based on this earlier basin by Briot. The V&A website explains that the Enderlein chargers “were not cast from an original but were made from moulds cut as line-for-line copies of the Briot dish”. (2) There are also ceramic copies of the Temperantia Basin, one of which is in the Louvre. Briot made another, very similar, charger, known as the very Mars dish, which is in the Louvre. According to the V&A website (2), it is Briot's Mars dish which is the basis of the Rosewater Dish rather than the Enderlein Charger. I have not been able to find a picture of Briot's Mars dish to compare it to the Enderlein charger, but as the design on the Enderlein Charger is so similar to that on the Rosewater Dish, I conclude that both were copies of one of Briot's original dishes. 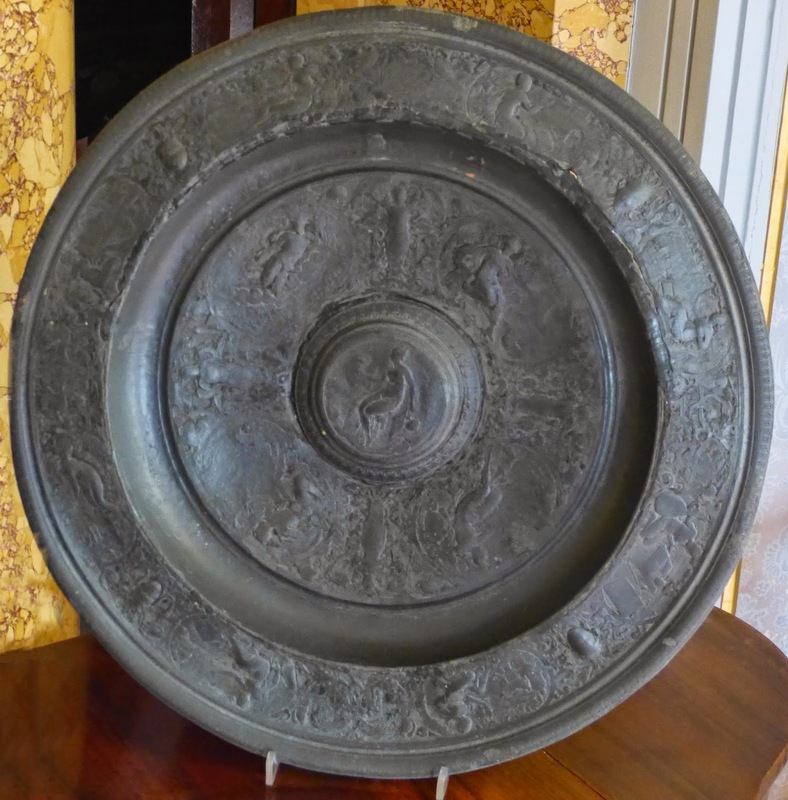 (1) In the Arlington Court guidebook, there is a picture of another dish - the Nurnberg Temperantia basin - which is not identical to the Enderlein Charger shown above. (2) From the V&A website. 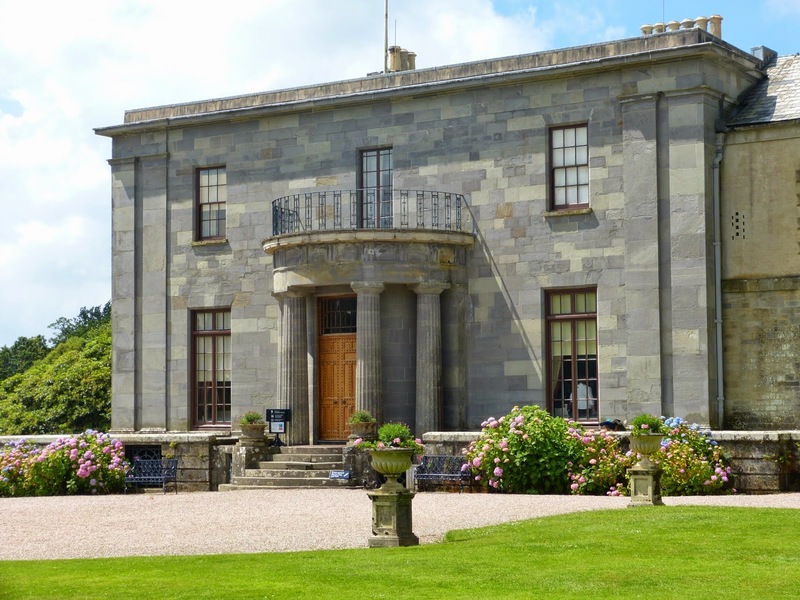 Arlington Court is a Neo-classical house near Barnstaple in North Devon. 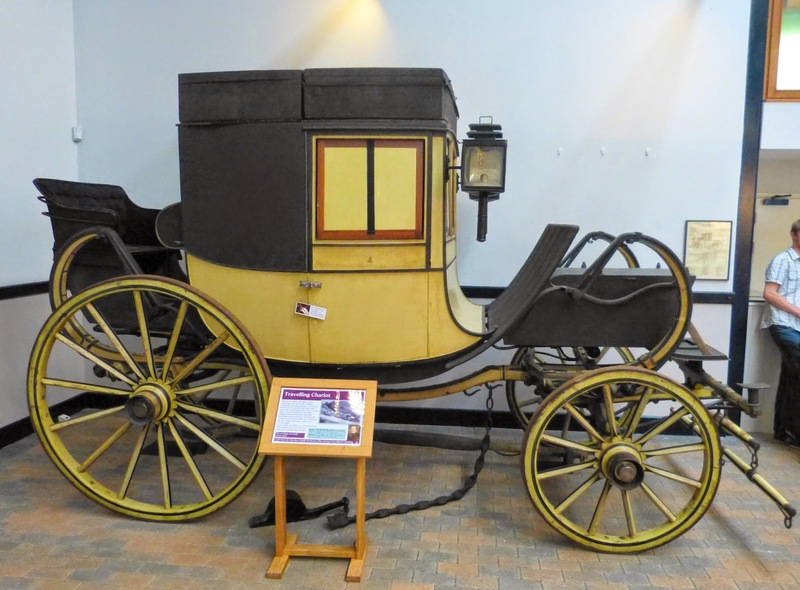 The stables are home to the National Trust Carriage Museum. 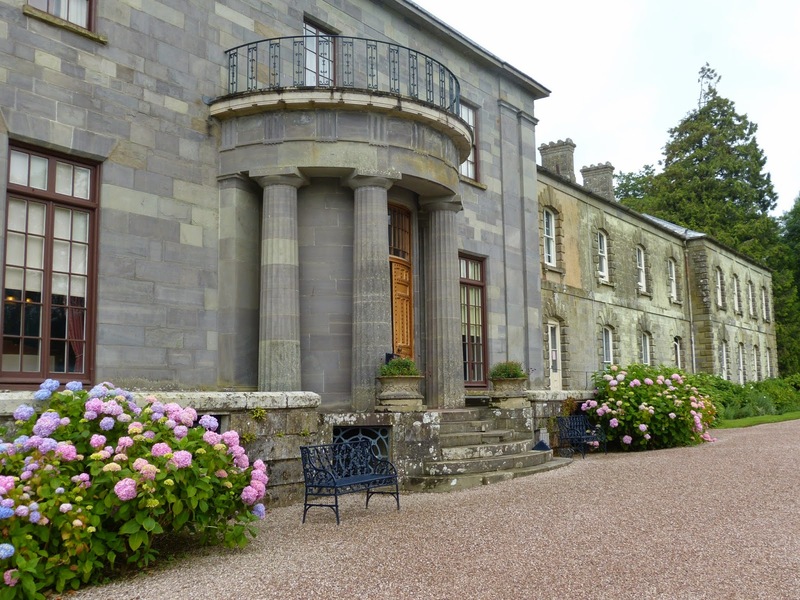 The Arlington estate was owned by the Chichester family who had been wealthy Devonshire landowners since the 14th century. They supported the King during the Civil War and had a strong Catholic heritage. A Georgian house was built at Arlington in the early 1790s and a second Georgian house, in the Neo-classical style, was built in the 1820s. It is this house that still stands today. The estate was given to the National Trust by Miss Rosalie Chichester in 1949. Colonel Chichester married Mary Anne Cary in 1790 and commissioned a fashionable Georgian mansion to be built at Arlington to replace the Tudor manor house he had inherited. After the death of his first wife in childbirth, Colonel Chichester married the Protestant, Agnes Hamilton, with whom he had six children. 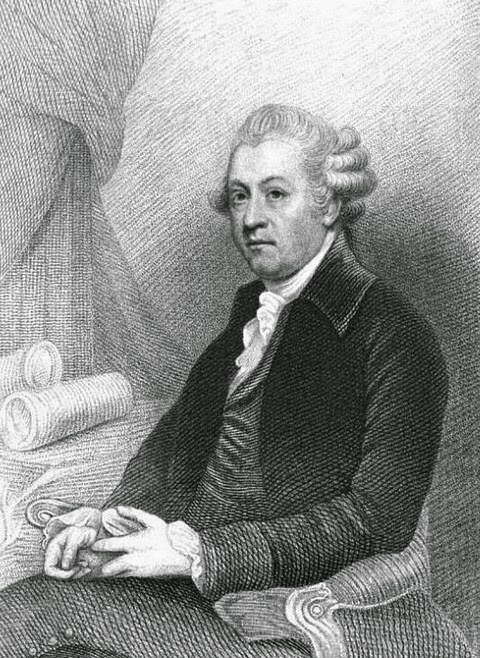 To the great distress of his family, he publicly renounced his Catholic faith in Exeter Cathedral in 1793. By the early 1820s, it became apparent that the Colonel’s Georgian house had structural issues and he commissioned the architect Thomas Lee to build him a new house in the Neo-classical style. This house was completed in 1823, but sadly Colonel Chichester died the same year and never lived in it. Known to his friends as ‘Arlington Jack’, Sir John Chichester served in the navy before inheriting Arlington on the death of his father in 1823. 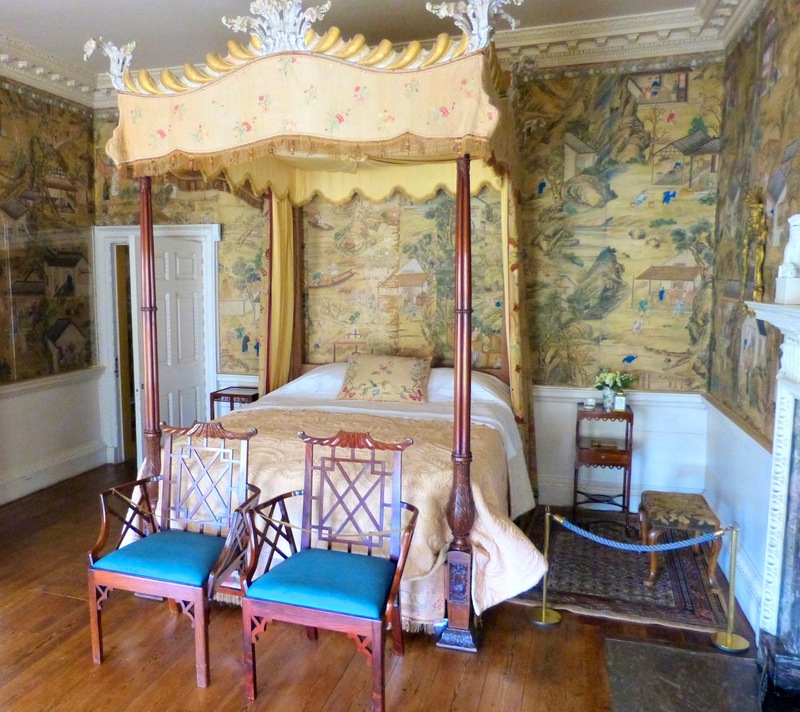 He decorated and furnished the house that his father had commissioned but never lived in; the Morning Room, Ante Room and Boudoir still have the original schemes of decoration. Sir John was a Whig MP for Barnstaple from 1831 to 1841 and he was made a baronet in 1840. He married Caroline Thistlethwayte in 1838 and had two children.